The Way of the Japanese Bath,Photographs by Mark Edward Harris. Published by Sashin Press, Los Angeles, 2010. Sashin Press, Los Angeles, 2009. This is the second edition of Mark Edward Harris' book, which was first published in 2003. It is gorgeously produced, with all the simple elegance one associates with Japanese culture - a tipped-in photo on a cloth-bound book, secured with clasps. The end paper is a polyptych woodblock print depicting a women's public bath, made by a Japanese artist in 1868. As an object, the book itself is a work of art. The 91 duotone images that make up the book are perfectly reproduced, and arranged in three sections - baths that are outside, baths that are inside, and after-bath rituals. Harris had a wide range to choose from in creating this work; as he notes in the foreword, there are some 20,000 thermal hot springs across the islands that make up Japan, the natural product of the same geological shifts that cause earthquakes and volcanic eruptions. 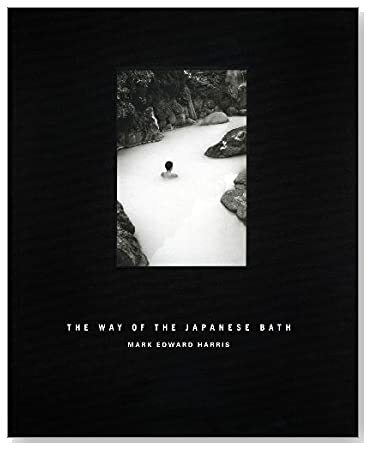 The Way of the Japanese Bath, by Mark Edward Harris. Published by Shashin Press, 2009. Bathing is a highly prized ritual in Japan - cleansing, with soap, takes place before a bath - and Harris captures the ritualistic sense of bathing in many of his photographs, including the austere, angular photo of a woman looking out a huge, steam-fogged wall of windows, only her head and shoulders visible above the war. A disquieting sense of mystery also permeates the photo of two men bowed underneath a cascade bath, founts of water pouring down from several feet above them, as a young boy lays on his side in shallow water. That said, there is something disappointing in this book. I couldn't help feeling as I went through the photos again and again, that as much as I liked some of the images, the overall work isn't really an act of discovery, or interpretation. There is a stiltedness that emerges through the pages, a sense of posing that isn't helped by the brief text that accompanies each image. Notes about "magnificent" hotel spas and "après-ski relaxation" sound a bit too much like travel brochure language, and don't offer much insight into "the way" of the Japanese bath. Perhaps the fact that the Japan National Tourist Organization provided "invaluable logistical support," according to Harris' acknowledgments, accounts for some of that uncomfortable feeling that however beautiful the images, this book feels a bit like a high-end pitch for a Japanese vacation, and not a genuine exploration of a culture.